Baby brains and nerves have an exuberant amount of neuroplasticity in the first 3 to 4 years of life, but in many cases, doing our current therapy interventions in an ineffective way wastes this potential. Many children at risk are not receiving regular therapy from a trained therapist until they outgrow the local 0 to 3y Early Intervention Program. These programs are of great value with respect to cognitive development, but most do not have either the training or the techniques to initiate early good tissue management. In too many areas, the focus is on creating function at the expense of quality of movement. One of the key differences between a similar brain or nerve injury in an adult, compared to a baby, is growth. The adult has a normally grown body while the baby undergoes ballistic growth, achieving half of their adult height by 2 to 3 years of age. This is important because an arm and hand affected by a brachial plexus injury do not grow as well as the opposite side. With decreased movement, there is decreased growth. For the child with a brain injury, leading to cerebral palsy, spasticity develops over the first years of life. Uncontrolled spasticity causes an even greater distortion of body growth. 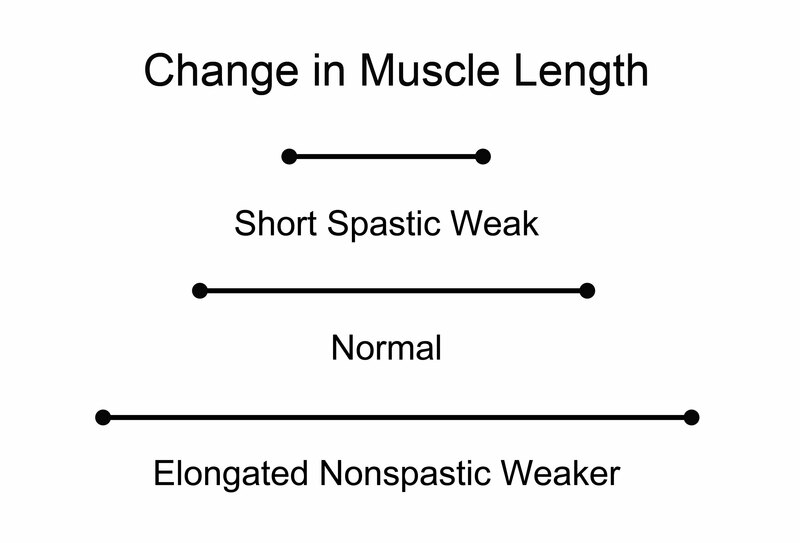 Spastic muscles are shorter and weaker than normal. The non-spastic antagonist muscles are longer than normal and even weaker than the spastic muscles. There are a wide variety of techniques that help both the child with cerebral palsy and the child with a brachial plexus injury. I will start with the common accepted therapies, and medications that have a primary goal of “allowing” the child to move in a more normal fashion. The first and simplest is regular stretching and massage. In my experience, stretching is frequently taught to parents as a first step in rehabilitation, but I question if they are truly taught the importance of this first intervention. I focus on parents understanding because over the years I have met so many people who either failed to stretch enough, or do it incorrectly. What is the correct way to stretch? I think we should be looking at how athletes take care of their muscles for some clues to effective stretching. The athlete who is training for a peak performance sport stretches many times a day and they never stretch their muscles “cold”. They either stretch after a warm-up exercise or after a passive warm-up like a warm shower or bath. A heating pad to troublesome muscle groups can be used for more localized tightness. One very smart mother taught me about whole bed heating pads, commonly used by massage therapists to keep their clients warm during a massage. She put one in her son’s bed and turned it on for 10 to 15 minutes in the morning before helping him out of bed. She found it far easier to stretch him after this “warm-up” period. I have been a pediatrician for over 30 years and I can confidently say that a vanishingly small number of parents manage to stretch their child after warming, twice a day. If you are not sure about a stretching technique or how to warm up the muscles in your child, speak to your physical therapist. He or she may refer you to a good massage therapist … they are the true experts in tissue management. The muscles of a peak performance athlete tighten up after exercise. They know that stretching and massage improves their recovery from the exercise as well as maintains their flexibility. Most adults automatically stretch when they get up from a long period of time hunched over a computer. My dog, a very intelligent German Shepherd, stretches every time she gets up from a nap. Babies stretch as they wake up from a nap in the same way. Children who have an early neurologic injury cannot do it on their own. In addition, they have unbalanced tone and muscle pull on their growing bones and joints. It seems obvious to me that we should be doing this work with them. In my view, it is the first and most important thing you can do for your child. It should be done at least twice a day, every day…just like brushing your teeth! If athletes stretch after exercise, why are most therapists not stretching the child at the end of a hard therapy session? Equally, do children not deserve a relaxing massage of their tight stiff muscles after a day at school? Dentists have done a much better job convincing all of us the importance of daily brushing. Tissue management with massage and proper stretching should be part of the daily routine of all children with any form of early muscle imbalance that limits their own ability to stretch. Twice a day, every day, until they stop growing. I expect to get a lot of negative feedback for this post, as I do when I teach it to a group of therapists and/or parents. The fact is that this treatment is boring and difficult to do on a daily basis. It does not fit easily into our lifestyle, but in terms of the child’s growth and development, it is an important first step. For parents who are following these posts, I hope you have made a list, for your own use, of the therapies that you do that are “how to” therapies that “allow” better movement. For therapists, I hope you will check that your families are doing the “allow” treatments while you focus on the “how to” component. Daily stretching and massage should be at the top of everyone’s “allow” list? If not, why not? I like the heating pad idea (having experienced it myself I’ll definitely vouch for it!). Your post did make me think about the way we teach parents to do stretching exercises. Maybe a good, but quick stretch of the problem muscles linked to an activity (like getting up or changing positions), will be more effective for the more active child than trying to put time aside each day for one or two big stretch sessions. Hmm food for though I think! Reply from Dr Pape: Thank you for the great comments. I visited your blog and really like your post on stretching as well. I will repost your blog on Facebook. I agree that the evidence base is limited in the pediatric PT literature, but the widespread use of the technique by athletes and aging adults indicates that individuals feel the benefit. I personally think the reason many studies fail to show benefit is that they use static cold stretches which are uncomfortable and of no benefit in children with increased tone. Do you know of a website or book for a stretching program for a 3-4 year old with hemiplegia? I could find general stretches for neurotypical kids, maybe that is good enough? We have never been given a stretching program. Even when I asked our PT, she was very vague and gave me some hamstring stretches to do with E, sitting with her back against a wall and straightening her legs and holding it (she watches video clips). Also laying down and starting with knees bent, then slowly straightening the affected leg and holding it to stretch the hamstring. Other than that, pretty vague. I would love to do more if I knew what I should be doing. E is pretty typical hemi, but not an active kid. I do not know of a book, but I hope one of the readers of this site might have a suggestion. In the absence of help from your PT, try going to a massage therapist for instruction. Frankly, I am shocked by your story. I would think that a massage and stretching home program would fall within the practice requirements for any therapist treating a child with cerebral palsy. You might consider speaking to the PT’s supervisor. Although stretching twice a day does sound a little tough with busy schedules I do appreciate your reminder of the importance of stretching regularly. My question is, I have a very active son, if I stop him after a physical activity to stretch would this be ideal as warm muscles are cause more effective stretching? I think that slowing him down with a heating pad will just make him upset and impatient. Thank you for your comment Shannon. Stretching mid way or after exercise works very well, whichever works best for timing. I think the warm up with a heating pad or warm bath works best for morning or night stretches. The after exercise one is one that all smart athletes do and this often helps the children accept it as it is athletic routine, not more therapy.